Just a walk with the earth dog. A brisk, mild wind, a shower, and the Brampton arm of the Nene filling its banks. And we came across this. 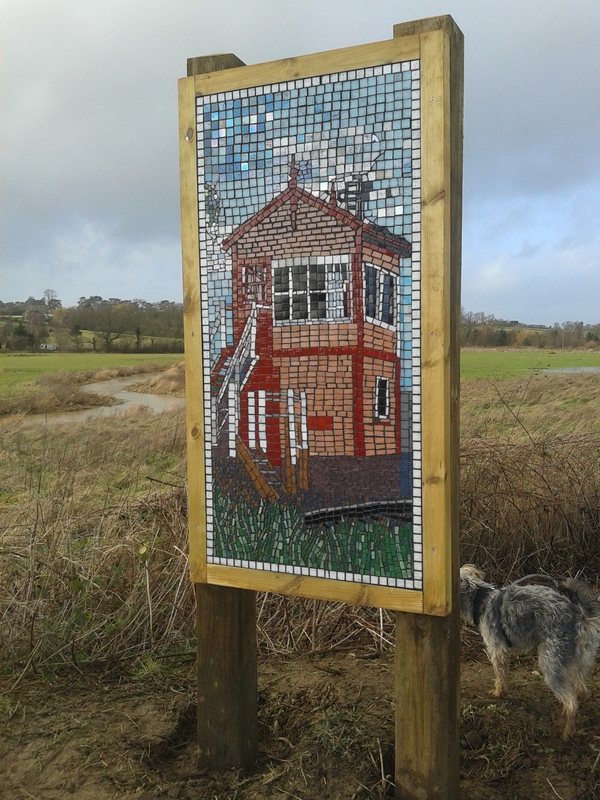 A tile mosaic of the nearby signal box, newly erected beside the track. I’m not sure why, and the mighty timbers supporting it look extremely determined, but it’s a bit of art in the landscape and I won’t complain at that. We got a bit rained on, but the ground hound didn’t mind too much. Very little bird life to see, but there were a few people walking up and down. We’ve had an inch and a half of rain since the year began, and the wind has made it feel most unpleasant. The weather will change, though, in a few weeks. Birds will sing and nest. Frogs will visit ponds. Coltsfoot will flower – if it grows round here – and the chthonic kunarion and I will feel the suns warmth on our backs. This entry was posted in Uncategorized and tagged Brampton Valley Way, dog on January 6, 2014 by baptissimo. That is one hec of a name you have given Cobb….is he really a subterranean greek dog….or is that just what Cobb comes up as on Google translate…..nice images to look forward to in the next few weeks. Well, he’s a terrier, from French terre, earth. So I like to think of him as a ground hound or whatever. Chthonic was a word that almost scared me the first time I came across it, so I was glad to have a chance to use it. I must keep an eye open for that! On Sunday, my cycling group preferred to use the roads rather than the BVW to pedal to the café at Waterloo Farm (Great Oxendon). Yes, I read your ride report. Too stony on the BWV for skinny tyres? Too mucky? Too many small dogs? It’s too mucky for anything but a mountain bike at this time of year – and you have to be prepared to get dirty! The other thing is (and this is probably heresy – so I’ll whisper) the BVW is rather boring and slow for experienced cyclists. It’s so straight and … we cyclists like hills! The mosaics are part of a community project by local artist Carole Miles. There are 12 panels reflecting different views taken from the BVW, 9 of which have been put up so far at different points along the way. I hope you enjoy finding the rest of them! Thank you. I think art and landscape can work really well together. I thought the colours on the two I saw were just right for their settings.